Discover the historic town of Akaroa and the magnificent natural beauty of the Banks Peninsula on this small group tour from Christchurch. Be amazed by the spectacular views of Akaroa Harbour and the Canterbury Plains on the high scenic drive from Christchurch, visit a cheese factory to taste locally made cheese and explore Akoroa village - the only French settlement established in New Zealand and picturesque harbour. You'll have the choice to join a nature and harbor cruise to see the rich variety of marine and bird life or to swim with Hector's Dolphins, the world smallest and rarest dolphins only found in New Zealand waters. 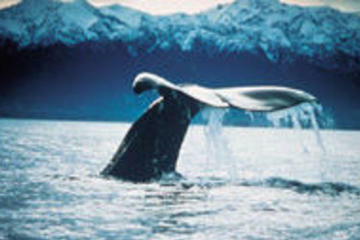 Spend the day getting close to nature on this Kaikoura Whale Watching tour from Christchurch. Travel by road through the rolling hill country of North Canterbury, enjoying the beauty of its rural pastoral scenes, to Kaikoura where mountains meet sea (approx 3-hours by coach). Kaikoura is world renowned for the variety of marine mammals which can be seen, not least of all the giant sperm whales and the acrobatic Dusky Dolphins. Return to Christchurch by train, on the Coastal Pacific train is one of the world's most scenic train journeys. See wildlife and stunning rugged coastline in the comfort of your train carriage. Journey to the remote and beautiful Mt Potts high country station, home of Mt Sunday; see how this peaceful mountain was transformed into Edoras, the capital city of the Rohan people in the Lord of the Rings trilogy. Immerse yourself in the natural unspoilt beauty of the high country's sparkling clear lakes, glistening blue rivers and fresh mountain air. This great day out includes 4WD access onto Mt Sunday itself, a delicious champagne picnic lunch, fully running commentary from a friendly and knowledgeable kiwi tour guide and spectacular scenery you will never forget. You don't have to be a Lord of the Rings fan to enjoy this amazing day out! The majestic beauty of the South Island is a must for any visitor to the South Island and one of the best ways to view the spectacular scenery is aboard a Great Sights luxury coach. This tour takes you from Christchurch, through diverse farmland to Lake Tekapo, where you can view the solitary Church of the Good Shepherd. 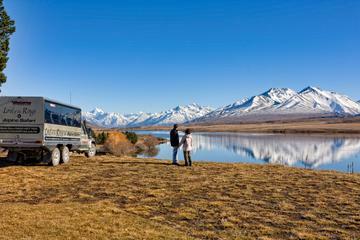 along the Tasman River before arriving at the location of New Zealand's tallest mountain Aoraki / Mount Cook. There is time to experience an optional scenic helicopter or ski plane flight (weather permitting) or walk on one of the may walking tracks before departing to New Zealand's adventure capital - Queenstown. Experience a brief tour of the major highlights of New Zealand's scenic South Island on this three day non-escorted independent scenic bus and train travel tour. Travel by coach from Christchurch to Queenstown and then up the rugged West Coast to Greymouth, before returning to Christchurch. During this travel journey, you will enjoy a visit to the Mount Cook National Park, view the glacier at Franz Josef and travel over the mighty Southern Alps. It is recommended an extended journey is taken, to incorporate additional days in Queenstown and Mount Cook, for a more relaxed sightseeing tour of the South Island. Enjoy some of the highlights of New Zealand's scenic South Island on this four day non-escorted independent scenic bus and train travel tour. Travel by coach from Christchurch to Mount Cook and Queenstown, where you stay for three nights, before returning to Christchurch. You also visit the majestic Milford Sound with a scenic cruise on this mighty fiord. See all the highlights of New Zealand's scenic South Island on a five-day guided non-escorted independent scenic bus and train travel tour. You'll travel by coach from Christchurch to Queenstown, experience the majesty of Milford Sound, view the glacier at Franz Josef and travel aboard the famous TranzAlpine Express train. Your five-day exploration of New Zealand's spectacular South Island begins with the stunning scenery of the foothills of the Southern Alps and a lunchtime visit to Mt Cook, New Zealand's highest mountain. After spending the night in Queenstown, you'll take an unforgettable cruise on majestic Milford Sound, surrounded by rock walls scarred by glaciers rising vertically from the sea. See all the highlights of New Zealand's scenic South Island on a five-day guided non-escorted independent scenic bus and train travel tour. You'll travel by the famous TranzAlpine Express train and scenic bus from Christchurch to Franz Josef to view the glacier, before travelling by scenic coach to Queenstown, on to Milford Sound by scenic coach to experience the majesty of Milford Sound as you cruise the Milford Sound and by scenic coach from Queenstown to Mt Cook/Aoraki and Christchurch. Your five-day exploration of New Zealand's spectacular South Island begins with the stunning scenery of the foothills of the Southern Alps and a lunchtime visit to Mt Cook, New Zealand's highest mountain. Visit the scenic South Island of New Zealand on this seven day non-escorted independent bus and train travel tour. Travel by scenic bus and train from Christchurch to the city of Dunedin, then head to Queenstown and up the rugged West Coast before returning to Christchurch. The highlights of this tour include a scenic cruise on majestic Milford Sound, a tour of the Scottish influenced city of Dunedin, viewing the mighty Franz Josef Glacier and enjoying scenic Taieri Gorge and TranzAlpine train journeys. Journey through the North Island of New Zealand and explore Waitomo, Rotorua and Lake Taupo, and discover the natural beauty of Kaikoura and Christchurch on this 5-day non-escorted independent scenic bus and train travel tour from Christchurch to Auckland. See the glow worms at Waitomo Caves, relax at Rotorua's geothermal wonderland, see giant sperm whales at play and be mesmerized by the natural beauty of New Zealand. This 5-day travel tour will have you travelling by coach, train and ferry with plenty of time at leisure to make this holiday truly magical. 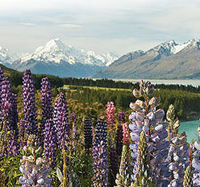 From Auckland, you can add one of the many independent travel/tour packages of the North Island from Auckland.